Collagen is a protein that occurs naturally in a number of structures in the human body, including the dermis, the lower level of the human skin. The skin consists of an upper layer, the epidermis, which serves as a protective barrier; and a lower level, the dermis, which contains a number of specialized cells and structures, including blood vessels, nerve tissue, hair follicles, and sweat glands. The dermis also serves as a framework and support structure for the skin as a whole. It is composed predominantly of fibrous tissue made of collagen. The function of collagen in the skin and in the other organs in which it occurs is to provide support, as well as connection to other body tissues and structures. Collagen is the element that provides skin with its firmness, suppleness, and resilience. As the years pass by, the framework of collagen that supports the skin begins to break down. Lines form in the face as repeated facial expressions and other external stresses place pressure on collagen fibers underlying the epidermis. This progressive deterioration and loss of collagen causes skin tissue to lose its elasticity and ability to remain consistently hydrated, which results in the sagging, wrinkling, and dullness that is associated with aging skin. To restore skin to a fuller, healthier appearance, collagen can be injected into the skin as a filler to smooth out and plump up the skin, reducing the visibility of lines and sags and improving skin tone. How are Collagen Injections Performed? Collagen injections are generally performed in a doctor's office or skin care facility. Prior to the procedure, the doctor or trained technician administering the injections will mark the points of injection on the skin with a pencil. An antiseptic will be applied to the skin to prevent infection. A local anesthetic may also be applied at the injection points, although most injectable collagen preparations contain a small amount of lidocaine, making a separate application of anesthesia unnecessary. Some injectable collagen fillers may require a skin test to be performed before a treatment to rule out the possibility that the patient will experience an allergic reaction. During the procedure, the collagen is injected directly into the dermis, the lower layer of skin. The needle will be injected directly into the lines, wrinkles, or depressed areas of the skin that have been identified as requiring treatment. Several injections may be needed to treat a single line or depression depending on its size. A single collagen injection treatment usually takes less than an hour to complete. If there are several areas on the skin that require treatment, then a patient may need to undergo multiple collagen injection procedures over a period of days or weeks. Collagen is injected into the dermis, which is composed primarily of naturally occurring collagen fibers, and absorbed directly into the lower layer of skin. The injected collagen supplements the skin's natural collagen, restoring the skin's surface to a smooth, plump, supple, and youthful appearance by increasing volume under the skin and providing support for the tissues of the skin's upper level, the epidermis. Some collagen-based dermal fillers are made with bovine collagen, while others are made from human collagen. What Areas of the Skin Do Collagen Injections Treat? Collagen injections can treat the skin on any part of the body that exhibits sagging, wrinkling, the formation of lines, and a lack of resilience. In addition, collagen injections can be used to improve the appearance of scars wherever they appear on the body. However, collagen injections are most commonly applied to the skin of the face. Collagen injections are used to smooth out and fill in frown lines in the forehead, crow's feet beneath the eyes, deep lines in the nasolabial folds, and areas of sagging and depression in the cheeks. 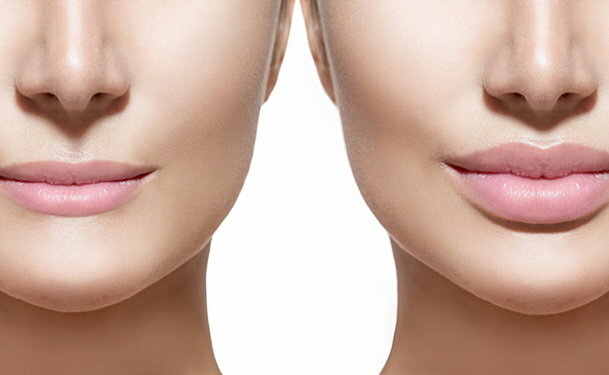 Collagen can also be injected into the lips to provide them with a fuller appearance. What are the Advantages of Collagen Injections Over Similar Treatments? The effects of collagen injections tend not to last as long as those of newer injectable dermal fillers, such as those that use hyaluronic acid as an active ingredient. 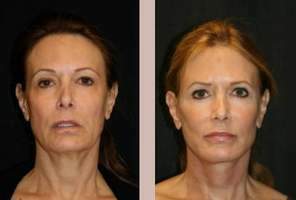 However, for many years, collagen was the only FDA-approved dermal filler available for the reduction of lines and sagging in the skin of the face. Thus, collagen, which was approved by the FDA for use in the United States in 1981, has a long track record of safety and effectiveness, an achievement that other dermal fillers have yet to attain. In addition, for those who have qualms about the introduction of artificial substances into the skin, collagen injections offers an active ingredient that occur naturally in the human body. Collagen injections also tend to cost less than some of the newer dermal filler treatments. The procedure also offers the advantage of minimal recovery time. Who is a Candidate for Collagen Injections? The ideal candidate for a collagen injection procedure is someone who is in good physical and psychological health, between the ages of 35 and 60, and beginning to notice the effects of aging, including crow's feet, smile lines, and frown lines, on the skin of his or her face. Collagen injections may be contraindicated for individuals who are pregnant or nursing, who suffer from certain autoimmune disorders, or, in the case of collagen made of bovine collagen, who are allergic to cow products. Collagen injections involve minimal, if any, pain. Those who undergo the procedure may notice bruising, swelling, redness, or mild soreness at the injection sites for a day or two following the procedure. Normal activities may be resumed immediately following a collagen treatment, although care should be taken to protect the skin from the sun for at least two days after the injections are administered. The effects of collagen injections are immediate. In some cases, the treated areas may actually appear to be overfilled, but this effect will dissipate within a couple of days to a week after the injections are administered and the skin will quickly resolve into a much more natural looking appearance. Collagen treatments are not permanent because collagen, as a naturally occurring biological substance, will eventually be broken down and absorbed by the body. However, the positive effects on the skin's appearance generally last between three and four months, sometimes longer. How long the treatment's effects last depends on many factors including where on the face the injections were administered, the patient's age and skin type, and the patient's daily activities. Collagen treatments, especially those based on bovine collagen, may trigger allergic reactions in some individuals. This is why, for most collagen injections, a skin test is required prior to the first treatment session. In addition, infection is a potential complication due to the injection of needles into the skin. However, when the collagen injections are performed by trained health professionals in a properly equipped and sterilized professional’s office with a sterile needle following the application of an antiseptic, the risk of infection is minimal or non-existent. In some instances, individuals who have undergone collagen injections may experience skin peeling, lumpiness in the skin, or scarring. However, these complications are rare. Are Collagen Injections Covered by Insurance? Because collagen injections are considered a purely cosmetic procedure, they are generally not covered by health insurance. Under some circumstances, some health insurance companies may cover the collagen injections when they are used to treat scarring.